There are a few vegetarian restaurants in Chiang Rai, but as most seem to be out of the center of town we only went to the one near the night bazaar – Oasis Vegetaurant. It’s a big place with plenty of seating and a huge choice of dishes. Oasis is a vegan, Thai and Chinese restaurant. Click here to book a hotel in Chiang Rai. The plate of food above cost 55 baht ($1.80, £1.20). The restaurant has a selection of about 15-20 hot dishes, plus about 5 or 6 fake meats. All of this food is pre-cooked and on display. On the wall behind the counter they also have a list of other dishes that can be cooked to order. This restaurant can be a little difficult to find, so hopefully the map above will help. I got this from North Hotel, which is a few doors down. The restaurant is on the street that links Sirikorn Market and the Night Bazaar. If you’re in the night bazaar food area, walk behind the stage, and you’ll see a row of small shops. Walk behind this row of shops, and Oasis vegetarian restaurant will be facing you at the end of the road. It’s about two minutes’ walk from the bus station. 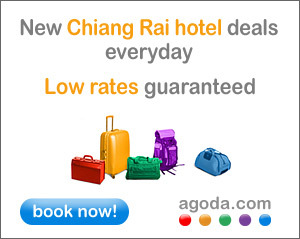 Click on the Agoda link below to check out some great hotels in Chiang Rai. We stayed at B2 Hotel, which we were very happy with.